For Starters takes a look inside the culinary lives of some of the food industry’s most interesting and influential figures. Food Writer, Stephanie Brookes, goes behind the scenes with the UK’s leading chefs, bakers and artisans to find out about their work, as well as their own personal relationship with food. It’s the bite-sized show for culinary aficionados, everywhere! For a food writer and sweet tooth like myself it was a treat to get to speak to baker and cake designer, Lily Jones. Lily has been at the forefront of the new wave of artisan bakers with her renowned bakery, just off the Columbia Road. If you’ve already visited, you’ll know the much-loved sausage rolls and brownies are worth the trip in itself. Lily’s career also includes two cookbooks, as well as curating the recipe book, Bake for Syria, shortly to be released on June, 20th. It was a great thrill to interview chef and writer, Chantelle Nicholson, at her outstanding London restaurant, Tredwells. Chantelle is renowned throughout the food world for her fresh, seasonal cooking, as well as her long-time, working partnership with chef, Marcus Wareing. In recent months, Chantelle launched her first solo cookbook, Planted, which delves into all things plant-based. It’s both an inspiring and also incredibly accessible read, with a real focus on great ingredients and bold flavours. Just try the Kimchi Pancakes – trust me! It’s always a great day when you get to interview one of your culinary heroes! 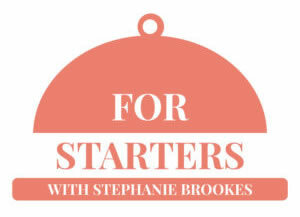 On this episode of For Starters, I sit down with Chef and Restaurateur, Martin Morales. His incredible career encompasses both the culinary, as well as the music world, with a true passion for his Peruvian heritage and the food he grew up with. In his work, he is continually inspired by the art, culture and people of Peru. I also had the opportunity to talk about his latest cookbook, Andina, and to learn more about the food and tradition of the Andes. I hope you enjoy!